Congressman Roscoe Bartlett (R-MD), right now speaking in front of Congress on C-SPAN, just informed us that "the elves, or God, or whatever, are not refilling the wells with oil." He just mentioned Matt Savinar. Oh! And "just like the cocaine addict, we are addicted to this energy!" BTW, Bartlett is down on biofuels. He "recently read an article by some scientists at Stanford and Berkeley" that bioethanol takes more energy to produce than it provides. He is also saying that hydrogen is also too energy intensive to produce to make it worthwhile. "It is no solution to our energy crisis." When noting that Europeans use about half the amount of energy that Americans do, Bartlett says we'd be hardpressed to argue that their lifestyles aren't as good as ours. "I see as many smiles on their faces as I see on American's faces," he remarks. "You're almost literally eating oil, Mr. Speaker, when you eat that food on your plate!" "I want to make the point that we're not running out of oil. Half of the oil that was ever there is still there. But we're not going to be able to use it at the quantities we're used to." "Matt Savinar may be correct, Mr. Speaker, when he says that life as we know it may be coming to an end, soon....I urge you to go read him." Taking a look at that graphic and where that arrow to peak oil is pointing, I'd say I admire the man and his efforts but Bartlett is a few bricks shy of a load 8). Well, you don't know what the scale is, exactly, or if the curve even is to scale...Maybe the peak is tomorrow, or maybe it's in 5 years. The rest of his graphics were considerably more informative (but this one was funniest). He's on the extreme end of things, but I think you still have to admire him and his balls for standing up in front of Congress and discussing this (not that there were many people in the room at all). BTW, Bartlett is down on biofuels. He "recently read an article by some scientists at Stanford and Berkeley" that bioethanol takes more energy to produce than it provides. in a comment on the thread Listening to the Experts. Its about ethanol fuels and uncertainty about the energy miracle they create for fueling our cars, SUVs and trucks. Here is the transcript from Thomas. Bartlett has our respect, and the brassiness of his testicles in dealing with unpleasant issues should earn him respect, and at least an audience. Unfortunately, the audience is what was missing. He got the same short shrift that congressmen get when dealing with pork issues - an all-but-empty chamber. The SPEAKER pro tempore. Under the Speaker's announced policy of January 4, 2005, the gentleman from Maryland (Mr. Bartlett) is recognized for 60 minutes. Mr. BARTLETT of Maryland. Mr. Speaker, if you go to your computer this evening and do a Google search for peak oil, you will find there a large assortment of articles and comments. Like every issue, you will find a few people who are on the extreme, but there will be a lot of mainstream observations there. One of the articles that you will find there was written by Matt Savinar. Matt Savinar is not a technical person. He is a lawyer, a good one, and he does what lawyers do. He goes to the sources and builds his case. I remember in another life I was involved in morphing some of my knowledge of human physiology into the practical world, and I was awarded 20 patents. For every one of those I had a lawyer. I knew that he knew absolutely nothing about the subject that he was helping me on before he came to work with me. By the way, Mr. Speaker, the 20 patents I had, 19 were military patents so these were military lawyers. I was really impressed with how quickly they caught on and knew what was going on and were able to contribute. When my wife read that she had the first reaction that I mentioned, Gee, this guy is a nut. I am not going to read any further. I said, Please read on and reserve judgment until you have finished reading his thesis. 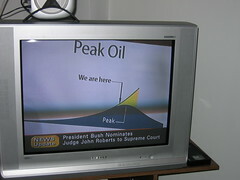 look for "Peak Oil ---July 19, 2005"
In recent weeks, spot prices for crude oil and natural gas have been both high and volatile. Prices for far-future delivery of oil and gas have risen even more markedly than spot prices over the past year. Apparently, market participants now see little prospect of appreciable relief from elevated energy prices for years to come. Global demand for energy apparently is expected to remain strong, and market participants are evidencing increased concerns about the potential for supply disruptions in various oil-producing regions. Yes. Greensapn is a brilliant mind and wants everyone to understand what it is that he is communicatiing --not. just pulled out the Greenspan stuff to the front page (thanks Mike). Dang, I missed his presentation this time. He's used that"screenshot" chart in previous presentations, it actually does a fair job of representing three facts: Consumption growth has been exponential, Oil will peak, and 'demand'* may outstrip supply well before supply peaks. I think it's a simple, yet elegant chart. *I've seen some economists argue that by defenition, demand cannot exceed supply - a kind of ohm's law of economics. I've replaced enough burned resistors in my time to know that the concept of 'resistance' is simple, but that in the real world, 'resistors' are more complicated. Some simple searching reveals that this Bartlett guy is not what you call an enlightning example to all of us. Just look up his voting record on google. Maybe in the US this is an acceptable poilitician, but in the rest of the world, we would call this a right wing religious nut. I tell you, the P.O. movement is in serious trouble if we have to depend on guys like that. We've got to be a bit more selective about the friends we choose.